The Coastside sky was an endless milky white as 29-year-old Don âBig Daddyâ? 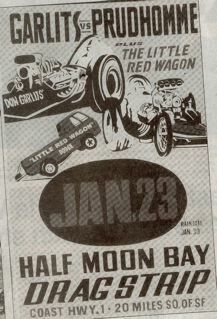 Garlits towed his âSwamp Ratâ?, the strange looking, low-slung drag strip racing machine, into the isolated Half Moon Bay Airport. Bold block lettering on the multi-windowed tower announced that Big Daddy had arrived at the Half Moon Bay Drag Strip: Where World Records Are Broken. It was 1966 and 1500 drag strip fans, young and old, gathered to witness the highly publicized battle of the year–a quarter-mile, 7-second rush of acceleration– between arch rivals Don Garlits and Don Prudhomme. Garlits, a Floridian, was always a star attraction, a âhired gunâ? that brought in the crowds, wherever he raced. But this time Garlits had had a bad year, losing important races on the East Coastâbut eveb worse he heard from a reliable source that the big trophy had been etched in advance with Don Prudhommeâs name. As the day of the big match approached, excitement soared among the dedicated group of drag strip fans. Who would win the giant trophy and the $5000 purse? Did the trophy really already bear Don Prudhomme, the Southern Californian’s name? Which man– and which machine–would emerge as #1?